Learn more about us, see our work, and contact us today to learn about our concrete services — concrete coatings, grinding, leveling, polishing, sealing, surface prep, and more! 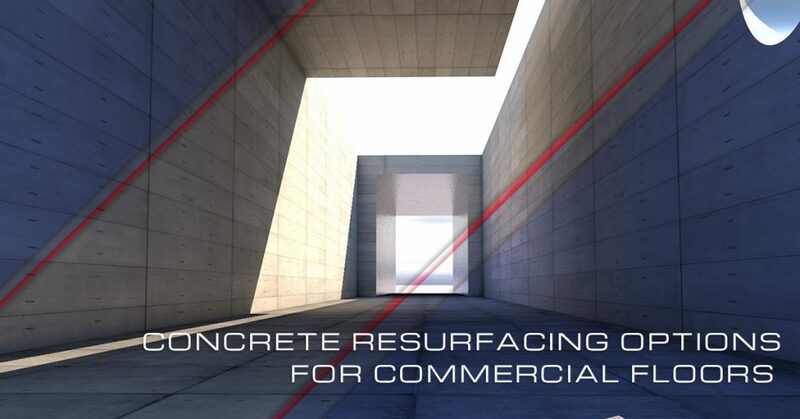 Read on to learn about popular concrete resurfacing options. As we mentioned, you may not think that your commercial floors are important or that blemishes and imperfections are a big deal. However, don’t be so quick to jump to this conclusion. Adding color to your concrete commercial floors can be a super simple way to conceal blemishes and turn a boring concrete floor into a beautiful work (and durable!) work of art. This can be achieved by first sanding down the floor to a smooth finish and then added color in the form of dyes or stains. Experienced concrete resurfacing companies, like All West Surface Prep, are able to match colors and dyes to your interior space or your desired look. If you are unsure whether your concrete floor would best work with a dye or a stain, we can help you make this decision. Whether you want to accent lines and shapes or mimic the feel of brick- or stonework, textures are a great way to beautify your floors and add some personality. Many concrete companies can even add stones and other aggregates. Not only do these texture-adding materials enhance aesthetics, but they also can improve safety by adding traction that will prevent people and vehicles from sliding and falling. Concrete finishes are mostly applied to commercial and industrial spaces that have exact floor requirements. For example, waterproofing, chemical protection, and heavy-load enforced finishes are all examples of finishes that may be applied during a concrete resurfacing project. These jobs typically help businesses optimize operations and save time, money, and energy. Polished concrete floors are a go-to choice for many commercial spaces for a number of reasons. You can find this type of commercial flooring in warehouses, hotels, retail stores, restaurants, hospitals, and more. A key reason why this process is chosen by so many is because it takes almost no additional work. Specifically, the top layer is resurfaced by using a polishing technique that is similar to sanding wood. The concrete is ground until it has reached a smooth and shiny surface. This not only seals the concrete, but it makes it remarkably durable and super easy to maintain. In previous blogs, we have talked a lot about concrete polishing. If you have yet to read these, start with this blog titled The Benefits of Polished Concrete. Concrete coatings are often made from epoxy, urethane, or acrylic. They are typically applied over a plain resurfaced concrete floor. This creates a strong protective layer that is durable and appealing. As Denver’s go-to concrete professionals, we take great pride in the wide variety of concrete coatings we are able to apply. Get in touch with us today to learn about your coating options. At All West Surface Prep, we have earned a reputation for being able to help our clients achieve their commercial flooring goals, and we take great pride in this. After we finish a concrete resurfacing project, you can expect to not only have a floor that meets all of your design and aesthetic goals, but also a floor that is remarkably durable and built to last. And when these are your results, you can ensure that your floor will reflect positively on your business and services. Our concrete professionals have decades of experience and have resurfaced concrete floors in facilities of all sizes and functions. Check out some of our past projects here. Contact All West Surface Prep today at 303-573-7737 to learn more and get your free concrete resurfacing quote.